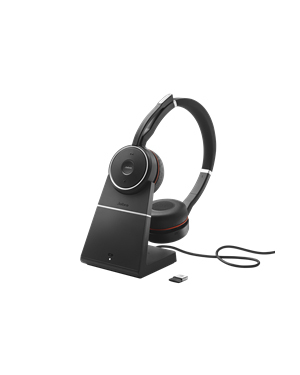 With the part number 7599-832-199, Jabra EVOLVE 75 Stereo MS Headset (With Charging Stand) is a wireless headset that is optimised for Skype for Business and is included in a package comprised of a Quick Start Guide, Jabra Link 370 USB Adapter, Optional Charing Stand, Protective Travel Case, and USB Cord that allows users to use the headset while charging. This wireless headset can cover up to 100 ft or 30 m and can be connected to two devices at the same time. It also features superior Active Noise Cancellation and inregrated busylight. Established in the year 1993, Jabra Corporation has been known to produce and introduce broad selections of innovative and high quality hands-free communication solutions and wireless headsets. Included in the GN Netcom, the company was started by Brean Murray and Randy Granovotter. The company sprung first from the Norcom Electronics Corporation, the Utah Corporation that was created in 1983 by Elwood “Woody” Norris. The company was shuffled to different hands for several times until it came to the hands of Norris Communications, Inc., a traded corporation that was also founded by Norris. Norcom earphone assets were spun of to the known creators of Jabra Corporation. Jabra is known to create thee industry’s first in-ear integrated microphone and speaker. The company also developed, introduced, and patented EarGels, which feature echo and noise cancellation technologies. It even takes pride in being the very first company to be capable of tuning a header over the air.